In this lesson I am going to cover a special technique that you may or may not always use. This technique is called color blending. Simply put, color blending is a way to mix two color together to produce a third color. For example, if you blend blue and red together, you get purple. There are other effects that can also be produced, such as semi-transparency. If you take an object you wish to draw, and blend each pixel with the one behind it, you can make the object look somewhat invisible. This particular effect will be covered in this lesson, although there are hundreds more that can be achieved. Because of the flexibility of color blending, DirectX requires that you specify exactly how you want your blending to be done. 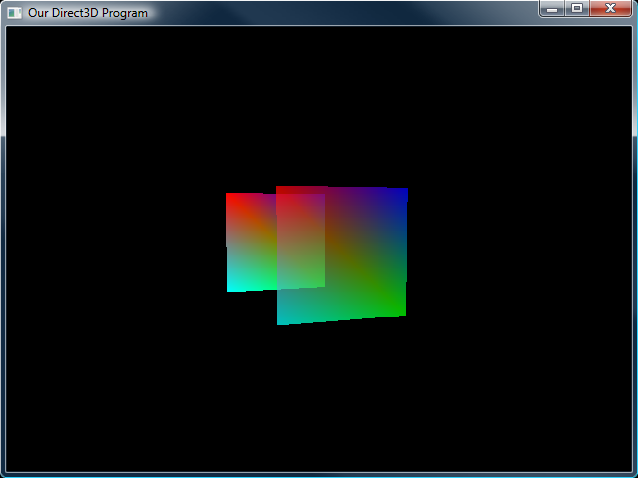 To do this, DirectX uses what is called a blend operation. A blend operation is simply an equation with two unknown values which, when filled, produce a third value. If you fill the two values with color, the third color is some combination of the two you provided. 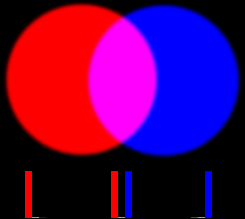 As you can see, each red, green and blue value from both colors were run through the equation, blended, and a new set of primary colors was produced. This is the basis of all color blending. Now let's look at this in detail. A blend operation (or blend equation) has five parts: the source color, the source factor, the operation, the destination color and the destination factor. Let's take a look at the whole equation, then go into each of the parts in detail. The values of these colors are automatically set based on what you are drawing, and nothing need be done for Direct3D to set these values. In color blending, each primary color is multiplied by some pre-determined factor. While this can get quite complex, building a simple color blend is quite simple. Before you begin rendering, you tell Direct3D what it should use for these factors. Usually, you will use an object's Alpha channel. We'll go over how this is done in a moment. When you select what factor is to be used, Direct3D always translates that value into a FLOAT between 0.0 and 1.0. In color blending, each primary color is multiplied by some other number between 0.0 and 1.0. Where that number comes from, you will determine (we'll go over how in the next section). In addition to the source factor and the destination factor, you are also able to set the overall operation used between the source and the destination. Available settings for this are addition, subtraction, minimum (the darker of the two colors) and maximum (the brighter of the two colors). Setting the parameters to D3DRS_ALPHABLENDENABLE and TRUE turns on color blending. This step is also simple, and requires another call to SetRenderState(). This time, the parameters are a little more flexible. D3DBLENDOP_ADD This is the one we'll use in this lesson. 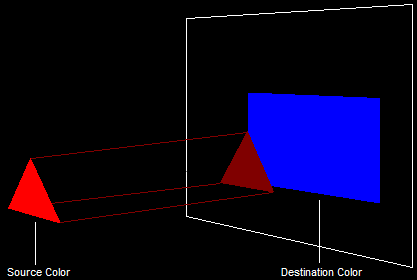 This indicates that the destination color will be added to the source color. D3DBLENDOP_SUBTRACT This indicates that the destination will be subtracted from the source. D3DBLENDOP_REVSUBTRACT This indicates the reverse of regular subtraction, that the source will be subtracted from the destination. D3DBLENDOP_MIN This indicates that the darker of the two colors will be used. Note that this is done to each primary color separately, not to the whole color. D3DBLENDOP_MAX This indicates that the brighter of the two colors will be used. D3DBLEND_SRCALPHA The factor used is the alpha value of the object being drawn. D3DBLEND_INVSRCALPHA The factor used is the inverse of the alpha value of the object being drawn. In other words, because the value is between 0.0 and 1.0, this would be equal to 1 - alpha. D3DBLEND_SRCCOLOR The factor used is the source color. D3DBLEND_INVSRCCOLOR The factor used is the inverse of the source color. D3DBLEND_DESTCOLOR The factor used is the destination color. D3DBLEND_INVDESTCOLOR The factor used is the inverse of the destination color. D3DBLEND_ZERO The factor used is zero, meaning the color is treated as if it were black. D3DBLEND_ONE The factor used is one, meaning the color is not changed at all. When reviewing the table, note that all the values mentioned there (such as the color and the alpha) start as a value between 0x00 and 0xFF (0 to 255) and get translated to a value between 0.0 and 1.0. This is the easy step. All we need to do is change the alpha values of each color in whatever object we're going to use. For this lesson, we'll use two squares, one somewhat transparent and the other fully opaque. Also, for simplicity we'll not use index buffers. Notice that instead of using the D3DCOLOR_XRGB macro, we're switching to the D3DCOLOR_ARGB macro instead. This one takes four parameters, the first being alpha, and the other three being red, green and blue. In this example, I've set the alpha for the first square as 191 (3/4 opaque), and for the second square as 255 (full opaque). And now let's look at the whole program. There are several parts taken out such as lighting and textures, while the transparency code was put in. Note: I haven't bolded every change in this example, as most of the changes from the last lesson are quite irrelevant here, and are simply there to clean up all the stuff we're getting rid of. That isn't all there is to color blending. There are fifteen different flags that you can plug into the source factor and the destination factor, not to mention the five different operations. This leaves you with 1125 different combinations of color blending. Of course, many do the same as other combinations, but there is still quite a bit to play around with. 1. Make the front square have 25% transparency. 2. Study the tables above and concoct your very own alpha blend. See if it does what you expected! 3. Try making both objects transparent, and switching their positions and see what happens. Congratulations! You now know the basics of Direct3D programming! But in case this worried you, never fear, for the adventure has only just begun!